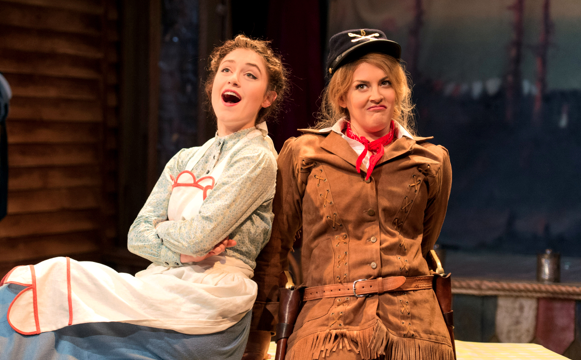 The strangest fact about the stage musical of Calamity Jane is that is has never been staged in either the West End or Broadway despite numerous sell-out tours of both the US And UK. Loosely based on tales from the life of Martha Jane Cannary, Calamity Jane is the equal of any man in the Wild West. Friend and Golden Gate saloon owner Henry Miller is under the impression that he’s hired famous actress Frances Fryer to perform, but when the very male Francis arrives, Calamity steps in to save the day, vowing to head from Deadwood to Chicago to bring back the darling of the age, stage sweetheart Adelaid Adams. But, as it ever was in musical theatre, things don’t go quite to plan, there’s mistaken identity, a love triangle thrown into the mix, and musical mayhem ensues. Packed with a plethora of familiar tunes: ‘The Deadwood Stage’, ‘Windy City’, ‘The Black Hills of Dakota’ (much-loved by this Glasgow audience who sang out full voice when the first few notes rang out from the stage) and of course, Oscar-winner ‘Secret Love’, this is a good old-fashioned crowd-pleaser. For all its fun and hi-jinks, underneath lies a very romantic and lyrically witty score which the cast do justice to. As is becoming their trademark, this Watermill Theatre production features a cast of actor/musicians and though personally not a fan, the device works well here and there’s no end to the places that musical instruments are produced from. 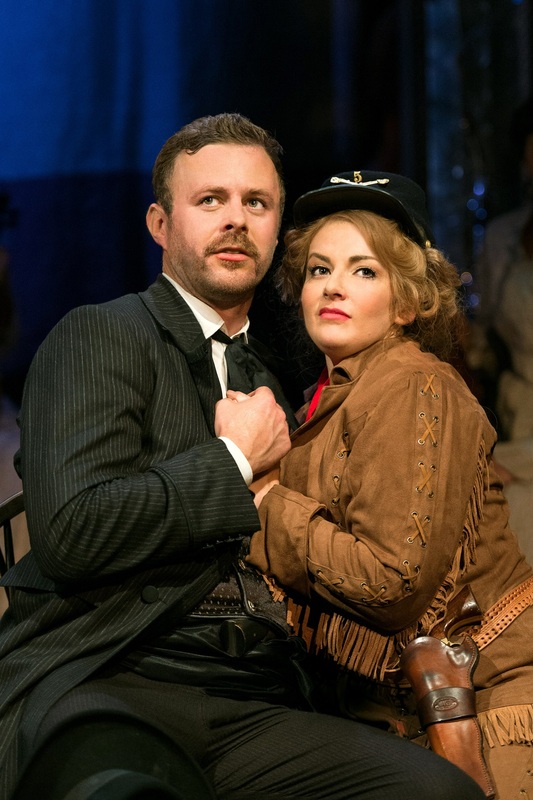 The cast are ably led by I’d Do Anything winner and audience darling Jodie Prenger as Calamity andEmmerdale‘s Tom Lister as Wild Bill Hickok. Prenger wins over the audience before a word is uttered, her entrance greeted by a round of whoops and hollers, and whilst in possession of a roof-raising voice and well-honed comedic skills, it is Lister who captures the heart, he has a truly beautiful voice, the only complaint being that you don’t get to hear enough of it. However, one note of criticism which can’t go unmentioned is the poor diction/accents of some of the cast members who rendered the narrative unintelligible for whole swathes of the first act. That said it improved as the show progressed. The static set doubles, triples and quadruples as every location in the show: pianos and chairs become a stagecoach, a door and some barrels become tables and it is richly lit and nicely dressed to give both a sense of time and place. 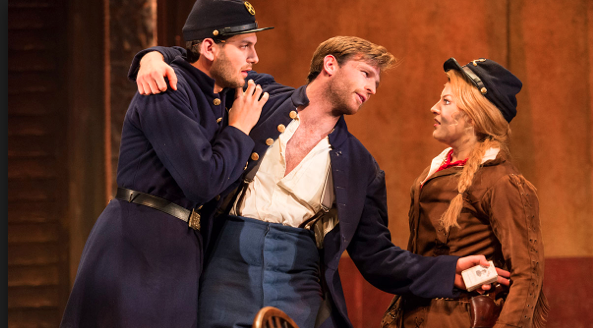 The first act seems disjointed and though long, doesn’t seem to cover much ground, the second and much more enjoyable act on the other hand, drives along at whip-cracking pace, bringing the romp to its happy conclusion. The production is suffused throughout with infectious energy and it is this, along with the cracking tunes that sends you back onto the street with a smile on your face. The popularity of this enduring classic shows no sign of abating. 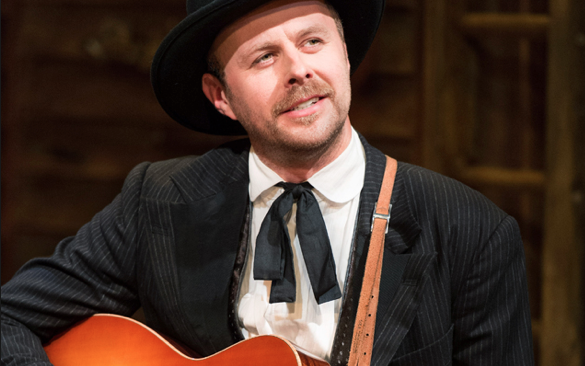 Get your cowboy hat on and get along to the King’s to see it while you can.